Published: First published in the UK in 1990 by Bloomsbury. 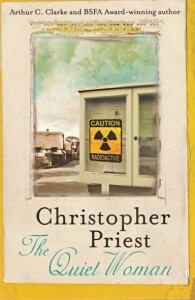 The cover image shown is from Gollancz’s 2014 paperback edition. Translations also exist. After a Chernobyl-like accident at a fast breeder reactor on the north coast of France, Britain is shrouded in radioactive fall-out. When her best friend is murdered, a young writer is forced to make sense of the deadly world she now occupies. This was originally published in misleading “mainstream” colours. Although a later paperback from Abacus made some amends, the first edition was not distributed or publicized well. It is one of CP’s infrequent forays into satire: a sardonic view of life in Britain under the philistine rule of Thatcher and the Tories, through the 1980s and early 1990s.